For the American musician, see Mike D'Antonio. For the American author and journalist, see Michael D'Antonio. After playing high school basketball at Mullens High School, in Mullens, West Virginia, D'Antoni played college basketball at Marshall University, with the Thundering Herd, from 1970 to 1973. After a college basketball career at Marshall University, D'Antoni was drafted by the Kansas City-Omaha Kings in the second round of the 1973 NBA draft. After playing three seasons for the Kings (1973–1975), he played for the Spirits of St. Louis of the American Basketball Association (ABA) in 1975–76, and for the San Antonio Spurs (again in the NBA) in 1976–77. His Spurs career lasted just two games, before he found an opportunity to play overseas. D'Antoni was signed by the Italian team Olimpia Milano, starting a career that saw him become the club's all-time leading scorer. He was voted the Italian LBA league's top point guard of all time in 1990, and paced his team to five Italian League titles, two FIBA European Champions Cup (now called EuroLeague) titles, two Italian Cups, one FIBA Korać Cup, and one FIBA Intercontinental Cup. During his playing career in Italy, D'Antoni earned the nickname "Il Baffo" (Italian for "The Mustache"), in reference to his ever-present facial hair. He also earned the nickname "Arsène Lupin" because of his ability to steal the ball. In 2015, Olimpia Milano retired his No. 8 jersey, in order to honor him. Being of Italian origin, D'Antoni was also selected to play on the senior men's Italian national team for the EuroBasket tournament in 1989. D’Antoni began his career as head coach for his most loyal club, Olimpia Milan. He remained there for four seasons, from 1990 to 1994, leading the club to a 1992 FIBA EuroLeague Final Four appearance, and a 1992–93 season FIBA Korać Cup title. He was then chosen to coach Benetton Treviso, another major Italian league basketball club. During his tenure with Treviso (1994–1997), the team captured the FIBA European Cup (later renamed Saporta Cup) and Italian Cup (in 1995), and won the Italian national domestic league title in the 1996–97 season. Coach D’Antoni's Italian club teams went to the Italian League's playoffs each season. In 2001, D'Antoni returned to Italy for a second stint, as the coach of Benetton Treviso. In his one season back in Europe, he led Treviso to a 28–8 regular season record in the Italian League, an Italian League championship, and to a 2002 Euroleague Final Four appearance, coaching a team filled with many former NBA stars. D'Antoni's first NBA coaching job was with the Denver Nuggets in 1997–98 as the club's director of player personnel. He also did some broadcasting work with TNT that season. The next year, he became the Nuggets' head coach, but was fired after a poor performance during the lockout-shortened 1998–99 season. D'Antoni then became a scout for San Antonio Spurs during the 1999–2000 season. He was also an assistant for the Portland Trail Blazers in 2000–01. 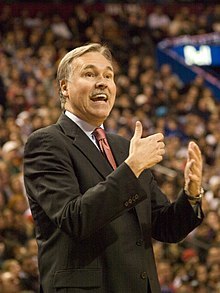 In 2002, D'Antoni made his return to the NBA as a Phoenix Suns assistant. In 2003, he was hired with 61 games left in the season as the Suns' head coach and, despite the team's failure to improve in the second half of the season, received a vote of confidence for producing inspired play from the injury-riddled team. With the acquisition of free agent Steve Nash before the 2004–05 season, an incredible turnaround began for the team. Nash was experienced in the run-and-gun style from his previous stints with the Dallas Mavericks and the Suns. He excelled running D'Antoni's pick-and-roll offense. D'Antoni won the NBA Coach of the Year Award after his Suns went 62–20 to finish first in the regular season. His style, dubbed "Seven Seconds or Less", was described in a book of that name. Overall, his Suns won 50 or more games in four consecutive seasons, while Nash earned NBA MVP honors in 2005 and 2006. In addition to Nash, D'Antoni's Suns also featured All-Star power forward Amar'e Stoudemire and high-flying small forward Shawn Marion. They made consecutive appearances in the Western Conference finals in 2005 and 2006, losing to the San Antonio Spurs and Dallas Mavericks, respectively. D'Antoni became the Suns' GM after Bryan Colangelo's departure and passed on the post to Steve Kerr in 2007. The Suns were eliminated in the playoffs by the Spurs in 2007 and 2008, after which D'Antoni left Phoenix for the New York Knicks. D'Antoni was selected to the coaching staff for the Team USA Olympic Basketball squad under head coach Mike Krzyzewski and participated in the 2006 FIBA World Championship, winning a bronze medal. Pundits believed his familiarity with the three-point shot and the zone defense, hallmarks of the international game, were valuable assets to the team. Although Steve Kerr requested he stay with the Suns, D'Antoni was told that he was free to speak with other teams about coaching jobs. On May 9, D'Antoni was made an offer by the New York Knicks. The next day, he accepted the 4-year, $24 million offer and became the Knicks' head coach. After two losing seasons, D'Antoni with new additions Amar'e Stoudemire and Carmelo Anthony led the Knicks to the playoffs in 2010–11 with a 42–40 record. They were swept by the Boston Celtics in the first round. D'Antoni resigned as coach on March 14, 2012, and assistant coach Mike Woodson filled his vacancy as the head coach. The Knicks were off to a disappointing 18–24 start, and D'Antoni clashed with Anthony. In the summer of 2012, D'Antoni returned to Team USA as an assistant coach again under head coach Mike Krzyzewski. He reunited with Knicks players Carmelo Anthony and Tyson Chandler on this team as they prepared for the 2012 London Summer Olympics. On November 12, 2012, the Lakers signed D'Antoni to a three-year contract worth $12 million. He replaced Mike Brown, who was fired as head coach after a 1–4 start to the 2012–13 season. The Lakers first contacted former Lakers coach Phil Jackson about the opening, but D'Antoni was hired in a unanimous decision by the Lakers front office. The Lakers felt that D'Antoni's fast-paced style of play made him a "great fit" for the team, more suitable than Jackson's structured triangle offense. Lakers owner Jerry Buss's preference has always been for the Lakers to have a wide-open offense. D'Antoni was reunited with Nash, who was traded to the Lakers before the season. Lakers star Kobe Bryant was also familiar with D'Antoni; Bryant as a child knew him when D'Antoni was a star in Italy and Bryant's father was also playing there. Bryant grew close to D'Antoni during their time with Team USA. D'Antoni's coaching debut with the Lakers was delayed as he recovered from knee replacement surgery. He had surgery weeks before on October 31, as he originally expected to take a year off from coaching and have months to recover. Bernie Bickerstaff, who was the Lakers' interim coach after Brown was fired, continued in that role after D'Antoni was hired. He was 4–1 as the interim coach, winning his last two as D'Antoni started leading team practices. D'Antoni named a new assistant to the Lakers' staff, his older brother Dan, who also helped with the practices. In his first press conference, D'Antoni predicted that the Lakers, then 3–5 and ranked 20th in scoring with 96.5 points per game, should instead be scoring "110–115 points a game". He wanted to revive Showtime. He reiterated general manager Mitch Kupchak's belief that the Lakers were built to win an NBA championship that season. D'Antoni was glad to be back with Nash, noting his unsuccessful stint with the Knicks without him. On November 20, he coached his first game—nine days after he was hired—in a 95–90 win against the Brooklyn Nets. In his first game back in New York in December, the Lakers lost 116–107 and dropped to 4–9 overall under D'Antoni. D'Antoni coached his first 17 games without Nash, who was recovering from a broken leg. The Lakers won three out of four after Nash returned in late December, but proceeded to lose their next six. Calling it a permanent move, D'Antoni benched forward Pau Gasol in mid-January and started Earl Clark to form the faster and smaller lineup the coach preferred. The team was already ranked No. 2 in pace. Halfway through the season, the Lakers were in 12th place in the Western Conference with a 17–24 record. Under D'Antoni, the Lakers were 12-19 while scoring an average of 103.3 points a game but surrendering 103.4. Offensively, they reached the 110-point threshold just eight times in the 31 games, going 5–3. D'Antoni stressed that the team's focus needed to be on its defense, not offense. He likened the Lakers to an All-Star team in which "everybody gets the ball and goes one on one and then they play no defense", adding that they "haven't learned that there's a pecking order" where stars need to know their roles. Nash struggled with center Dwight Howard to run the pick and roll, a play D'Antoni expected to be a staple for the Lakers. D'Antoni eventually dropped his offense and played without any system. "We play basketball. The system is move the ball, play hard defense, space the floor and who's open shoots. It's not a difficult thing", said D'Antoni. The coach moved Nash off the ball and made him more of a spot-up shooter, while Bryant became the primary facilitator on offense. The defense was also more energized. D'Antoni was named Western Conference Coach of the Month after the Lakers went 7–1 in April. They finished the season 28–12 after dropping to 17–25 in January the day of their team meeting in Memphis. They qualified for the playoffs on the final day of the season, securing the seventh seed in the West. The Lakers' expected starting five of Bryant, Nash, Howard, Gasol and Metta World Peace started together just seven times all season and without registering a win. "The Lakers didn't help things by making the coaching change and putting [D'Antoni] in that situation, which he was glad to take. But I think it was a little bit tougher than he thought it would be", Kupchak said. The Lakers faced San Antonio in the playoffs and lost in the opening round for the first time since 2007, suffering their first opening-round sweep since 1967. In D'Antoni's first full season with the team in 2013–14, the Lakers went 27–55 for the second-worst winning percentage (.329) in team history. It was the worst 82-game record in team history and their fewest wins since the franchise moved from Minnesota. Howard left before the season as a free agent, accepting less money to join the Houston Rockets. Bryant played in just six games during the season, but he and Gasol were critical of D'Antoni's small-ball system. Nash also missed most of the season with injuries. On April 30, 2014, D'Antoni resigned as coach of the Lakers after the team declined to pick up their option for him to coach in 2015–16. He was paid an undisclosed amount of the $4 million owed him for the upcoming 2014–15 season. "Given the circumstances, I don't know that anybody could have done a better job than Mike did the past two seasons", said Kupchak. On December 18, 2015, D'Antoni signed with the Philadelphia 76ers to work as associate head coach under Brett Brown. On June 1, 2016, D'Antoni was named the new head coach of the Houston Rockets. On May 7, 2017, D'Antoni and Erik Spoelstra were announced as co-recipients of the inaugural Michael H. Goldberg NBCA Coach of the Year Award. On June 26, 2017, he won the NBA Coach of the Year Award. D'Antoni was born in Mullens, West Virginia, and played basketball at Marshall University. His father was a high school basketball coach in West Virginia and Ohio, and was inducted into West Virginia's Sports Hall of Fame. His older brother Dan coached under him as an assistant in Phoenix, New York, and Los Angeles. Both Mike (1997) and Dan (1990) have been enshrined in the Marshall University Athletics Hall of Fame. D'Antoni is a dual citizen of the United States and Italy, making him the first Italian to lead an NBA team. He descends from an Italian grandfather who emigrated from Umbria, Italy, to the U.S. in the first years of the 20th century. He is fluent in English and Italian. He lives in the Memorial neighborhood in Houston, with his wife, Laurel, and has a son, also named Mike. ^ "Mike D'Antoni NBA & ABA Basketball Coaching Record". Basketball-Reference.com. May 8, 1951. Retrieved November 21, 2012. ^ a b "Rockets Name Mike D'Antoni Head Coach". NBA.com. June 1, 2016. Retrieved June 1, 2016. ^ Mike D'Antoni CARRIERA (in Italian). ^ Il teorema del Baffo (in Italian). ^ "Hall of Fame 22: Mike D'Antoni | Pallacanestro Olimpia EA7 – Emporio Armani Milano". Retrieved August 21, 2016. ^ 1989 European Championship for Men Italy 5 - Michael Andrew D'Antoni. ^ MIKE D'ANTONI ITALY European Championship for Men 1989. ^ "Coaches: Mike D'Antoni". National Basketball Association. Retrieved January 28, 2008. ^ a b c d e Beck, Howard (November 12, 2012). "The Lakers Change Direction and Hire D'Antoni as Coach". The New York Times. Archived from the original on November 13, 2012. ^ "Sun to hire Kerr as GM". TimesDaily. Associated Press. June 1, 2007. p. 5C. Retrieved May 21, 2013. ^ Beck, Howard (May 11, 2008). "D'Antoni Accepts Offer to Coach Knicks". The New York Times. Retrieved December 26, 2008. ^ "D'Antoni takes Knicks' job". Yahoo! Sports. May 11, 2008. Retrieved December 26, 2008. ^ "New York Knicks coach Mike D'Antoni resigns". ESPN. March 14, 2012. Retrieved March 14, 2012. ^ Trudell, Mike (November 12, 2012). "Lakers Hire Mike D'Antoni". nba.com. Archived from the original on November 12, 2012. ^ a b c Bresnahan, Mike (November 13, 2012). "Kupchak: If Phil Jackson hadn't hesitated he might be Lakers coach". Los Angeles Times. Archived from the original on November 14, 2012. ^ a b McMenamin, Dave (November 13, 2012). "Kupchak: Mike D'Antoni a better fit". ESPN.com. Archived from the original on November 14, 2012. ^ a b Bresnahan, Mike (November 12, 2012). "Mike D'Antoni to be next coach of the Lakers". Los Angeles Times. Archived from the original on November 12, 2012. ^ Beck, Howard (November 13, 2012). "For the Lakers and D'Antoni, It's About Validation". The New York Times. Archived from the original on November 19, 2012. ^ Beck, Howard (November 18, 2012). "D'Antoni, Recovering From Knee Surgery, Pushes Back Lakers Debut". The New York Times. Retrieved November 19, 2012. ^ a b c McMenamin, Dave (November 16, 2012). "Mike D'Antoni leads Lakers practice". ESPN.com. Archived from the original on November 21, 2012. ^ Moore, David Leon (November 20, 2012). "Mike D'Antoni debuts on Lakers bench: 'This is special'". USA Today. Archived from the original on November 21, 2012. ^ Bresnahan, Mike (December 12, 2012). "Mike D'Antoni says Lakers would love to play 'Showtime' ball". Los Angeles Times. Archived from the original on December 12, 2012. ^ "Lakers edge Nets as Mike D'Antoni makes debut on L.A. bench". ESPN.com. Associated Press. November 20, 2012. Archived from the original on November 21, 2012. ^ Bresnahan, Mike (December 13, 2012). "Lakers' defense takes night off against Knicks, 116-107". Los Angeles Times. Archived from the original on December 15, 2012. ^ Markazi, Arash (January 7, 2013). "Five key questions for the Lakers". ESPN.com. Archived from the original on January 8, 2013. ^ Bolch, Ben (January 8, 2013). "Steve Nash reaches milestone but is it on a Lakers road to nowhere?". Los Angeles Times. Archived from the original on January 10, 2013. ^ "Dwight Howard returns to help Lakers end 6-game losing streak". ESPN.com. Associated Press. January 13, 2013. Retrieved January 14, 2013. ^ Bresnahan, Mike (January 21, 2013). "Lakers keep falling on court and in standings". Los Angeles Times. Archived from the original on January 22, 2013. ^ a b Golliver, Ben (January 21, 2013). "Lakers' Pau Gasol benched for Earl Clark by coach Mike D'Antoni". SI.com. Archived from the original on January 26, 2013. ^ Bolch, Ben (January 25, 2013). "Despite win over Utah, Lakers have a long way to go". Los Angeles Times. Archived from the original on January 26, 2013. ^ Bresnahan, Mike (January 22, 2013). "Forget 'Showtime,' struggling Lakers may need slow time". Los Angeles Times. Archived from the original on January 22, 2013. ^ McMenamin, Dave (January 23, 2013). "GM: Mike D'Antoni not the problem". ESPN.com. Archived from the original on January 23, 2013. ^ Bresnahan, Mike (January 23, 2013). "Lakers 'went at each other a little bit' in morning meeting". Los Angeles Times. Archived from the original on January 24, 2013. ^ a b Bresnahan, Mike (January 23, 2013). "The Lakers don't even talk a good game". Los Angeles Times. Archived from the original on January 24, 2013. ^ a b Verrier, Justin (January 30, 2013). "1. Lakers Just Trying To Keep It Simple". ESPN.com. Archived from the original on February 1, 2013. ^ a b c McMenamin, Dave (January 27, 2013). "Lakers rise as D'Antoni's offense ditched". ESPN.com. Archived from the original on February 1, 2013. ^ Shelburne, Ramona (January 28, 2013). "Have the Lakers found their groove?". ESPN.com. Archived from the original on February 1, 2013. ^ McMenamin, Dave (January 30, 2013). "Lakers must prove it on road". ESPN.com. Archived from the original on February 1, 2013. ^ a b Markazi, Arash (April 18, 2013). "D'Antoni named West Coach of the Month". ESPN.com. Archived from the original on April 19, 2013. ^ Adande, J. A. (April 17, 2013). "1. Lakers Make Playoffs After Season On Brink". ESPN.com. Archived from the original on April 19, 2013. ^ Shelburne, Ramona (April 26, 2014). "Mike D'Antoni seeking team option". ESPN.com. Archived from the original on April 26, 2014. ^ a b "Lakers' Mike D'Antoni steps down". ESPN.com. April 30, 2014. Archived from the original on May 1, 2014. ^ a b Bresnahan, Mike (April 30, 2014). "Mike D'Antoni resigns as Lakers coach". Los Angeles Times. Retrieved April 30, 2014. ^ "Sixers Name Mike D'Antoni as Associate Head Coach". NBA. December 18, 2015. Retrieved December 18, 2015. ^ Reynolds, Tim (May 7, 2017). "Erik Spoelstra, Mike D'Antoni share NBCA Coach of the Year award". Chicago Tribune. Retrieved October 18, 2017. ^ "Dan D'Antoni joins brother on Knicks staff". The Herald-Dispatch. June 21, 2008. Retrieved May 28, 2012. ^ "Hall of Fame 22: Mike D'Antoni". www.olimpiamilano.com. August 2, 2013. Retrieved March 21, 2017. ^ Beck, Howard (September 30, 2010). "Knicks Practice in City That Made Coach's Career". The New York Times. Retrieved March 21, 2017. ^ "Local interior designers prepare home of Rockets coach Mike D'Antoni for team holiday party". ABC13 Houston. December 23, 2016. Retrieved May 10, 2018. Wikimedia Commons has media related to Mike D'Antoni.